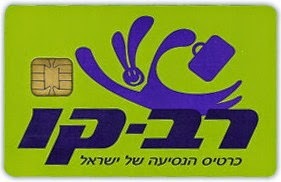 The Rav Kav is Israel's version of an all purpose transit card. It can be loaded with up to eight different series of payment options, from a variety of different companies. For example, if you live in Jerusalem, but work in Tel-Aviv, you can have your Jerusalem city bus and light rail pass encoded on the same card with your your round-trip tickets between the two cities, and your Tel-Aviv city bus pass. Then there is still room for five more passes or series tickets. Sure, you can theoretically be tracked, but the system is convenient, right? Well, there is a catch, or two. I recently lost my Rav Kav. No problem. I'll just get a new one, right? It was even promised that since the computerized system keeps a record of what gets purchased and loaded into it, and would even be able to recover my monthly pass, lost along with it. I got my card replace from the Egged Bus Company easily enough. There was a line. But, they had five stations open to receive customers, and they were open until 7:00pm. So, there was no need to miss work. I was told the the remaining trip ticket I had on my pass would take a week to replace. OK. No big whoop. Unfortunately, I had purchased my monthly pass at one of the light rail ticket machines. Sine the light rail is operated by Citypass, and not Egged, I had to get my replacement pass from Citypass, which, as I had anticipated, was only open from 9:00am to 5:00pm, and a few hours on Friday, making it a heck of a lot less convenient than dealing with Egged. Like the last time I had to torture myself at the Citypass office in the Klal Building, I stood there for way too long, and not because there were a lot of other people there, either. There were three people working there, but only one seemed to be handling a customer at a time. It seems like there were some computer issues. So, maybe it was a fluke. Still, I did not understand why it took so long. Finally, I reached the counter. The clerk recognized the print out I had received from Egged, already knew what I needed, and began to process it. That was a pleasant surprise. But, what was not a very pleasant surprise was that since I came in one day too late, I could not receive a replacement of my pass for the current month. Instead, I would have to wait until the next month, at which time I would still have to come in, in order to get my Rav Kav charged with the new pass. From now on, I think I will still with Egged for one-stop shopping, which I can do without leaving work early, or have to schlep in on a Friday. Who Really Won the 2015 Israeli Elections? European Jews, It's Time to Stop the Insanity! Why Won't MK Ruth Calderon Just Go Away?